This specimen was collected 26 mi. south of Scenic, South Dakota in Protoceras Channels dated to the Whitneyan stage of the Oligocene. 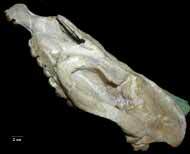 It was made available to The University of Texas High-Resolution X-ray CT Facility for scanning by Matthew Colbert of the Department of Geological Sciences, The University of Texas at Austin courtesy of the South Dakota School of Mines, Museum of Geology. This specimen was scanned by Matthew Colbert on 6 July 2002 along the coronal axis for a total of 602 slices. Each slice is 0.5 mm thick, with an interslice spacing of 0.5 mm and a field of reconstruction of 140 mm. 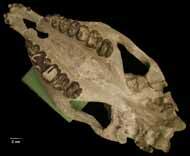 To cite this page: Dr. Matthew Colbert, 2005, "Protapirus simplex" (On-line), Digital Morphology. 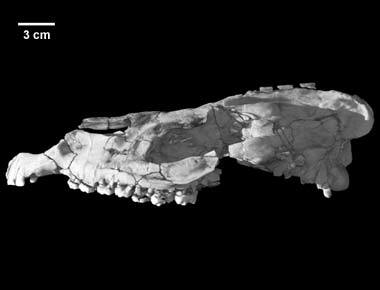 Accessed April 25, 2019 at http://digimorph.org/specimens/Protapirus_simplex/.